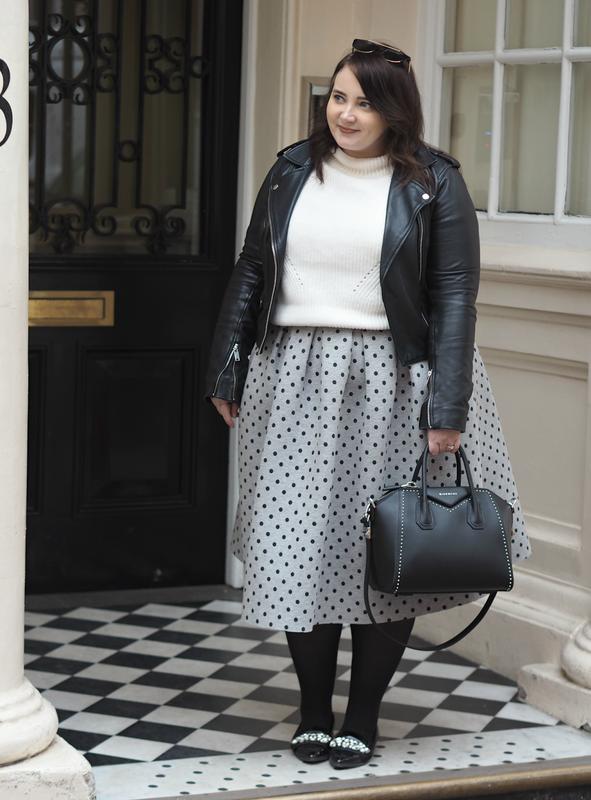 I’m getting quite into my outfit posts. 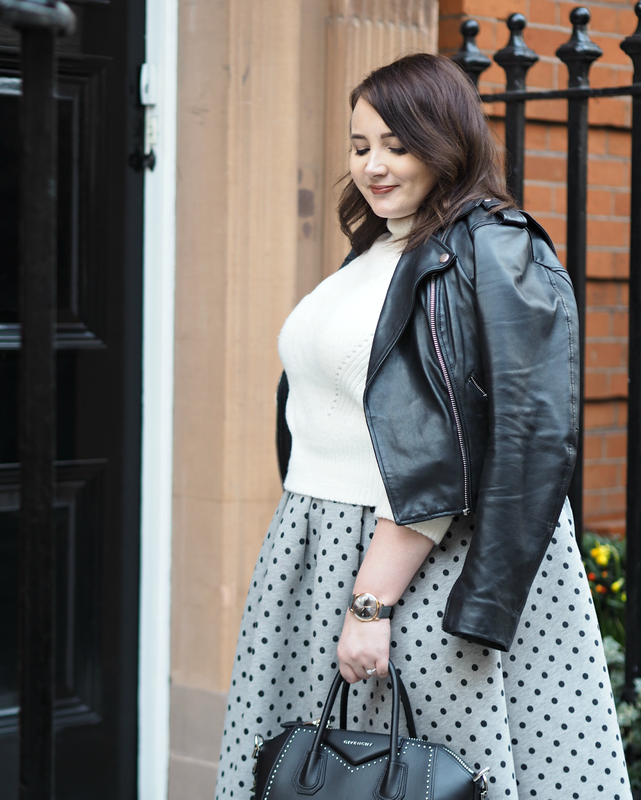 When I first started it was an odd sensation, standing in the middle of the street letting someone snap your photo and not really knowing where to look, but over the last few weeks I’ve definitely gotten into my stride – and developed my standard poses! It helps when you think that you’re never going to see any of those curious faces again, that the streets of London are often so full of obscure goings on that a generic looking woman having her picture taken is really not going to stand out as the most memorable thing of the day. My outfits have been received so well, and you guys have been so positive, that it’s definitely worth that slightly awkward hour in the street. So here’s another! 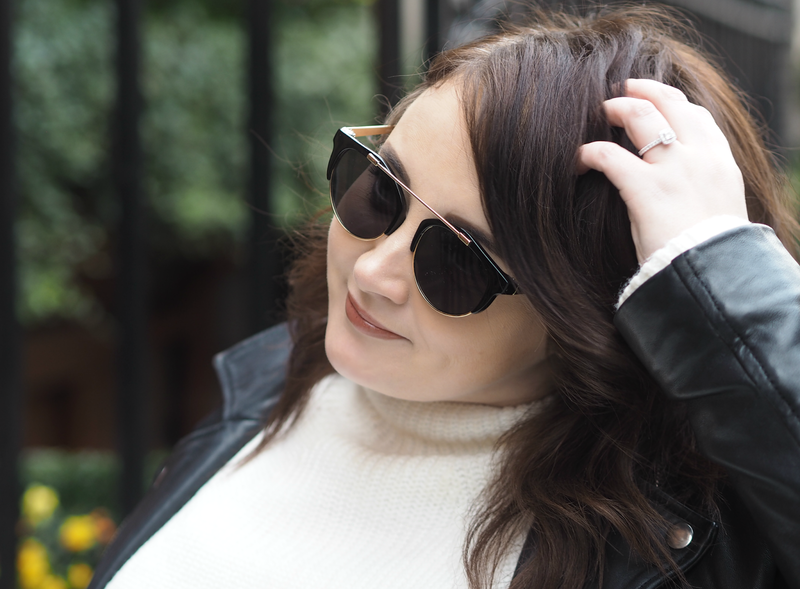 Myself and a few other bloggers have started to meet up every couple of weeks to catch up, discuss work plans, brainstorm and generally get inspo to keep us tied over for the following days. It’s such a good way to keep your mojo strong and to connect with like-minded people (often bloggers are operating so solo that you can easily end up isolated, frustrated or lacking motivation,) which we tie in with a tasty brunch and even a couple of meetings. Right now the second floor cafe in Fenwicks is our fave hangout, not only because of the tasty food and super accommodating staff who let us take over a booth for a day, but because you can always celeb spot: last time we had lunch across the way from Joan Collins! These shots were taken a stone’s throw away from New Bond Street, where there are so many beautiful old fashioned buildings and flowers blooming as we step into spring. A few doors down is the iconic Claridges, so I was in pretty good company for the afternoon – and the decor even matched my outfit! 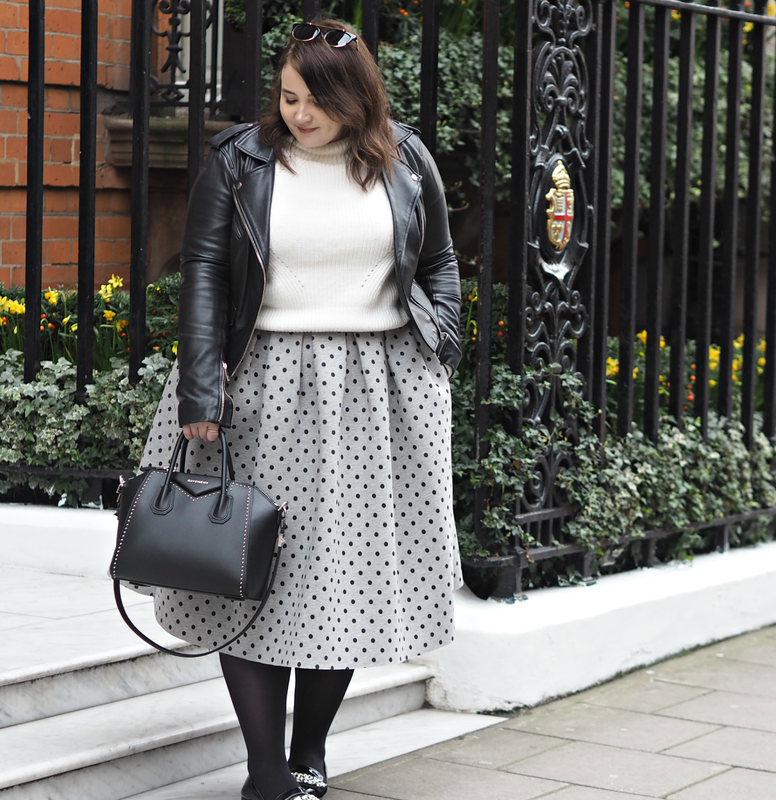 I have to admit this entire look has been re-hashed from things I’ve had in my wardrobe for an age and completely forgotten about; isn’t that the best feeling, when you rediscover something and repurpose it into a brand new look? 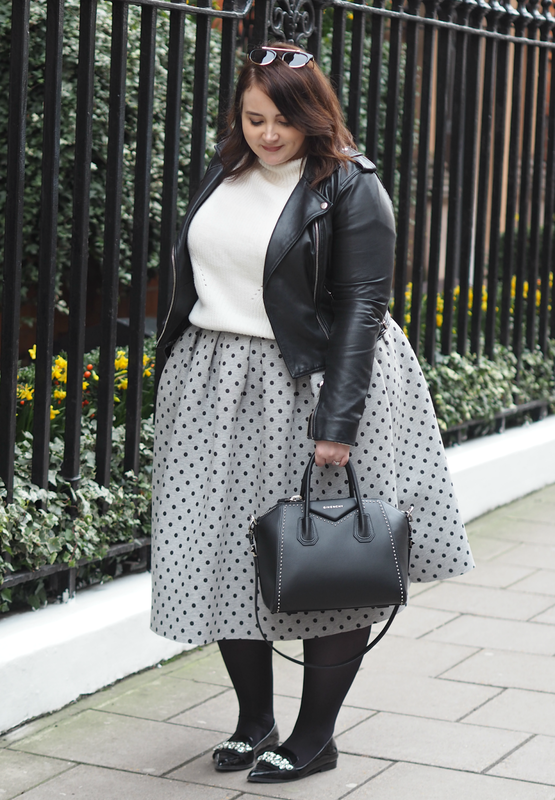 The skirt is Topshop, bought a couple of years ago, and is equally great with a t-shirt in the summer as with tights and a jumper in the winter; because it’s very volumous and made of a thick sweater-like material, it keeps you warm but also keeps you cool too. 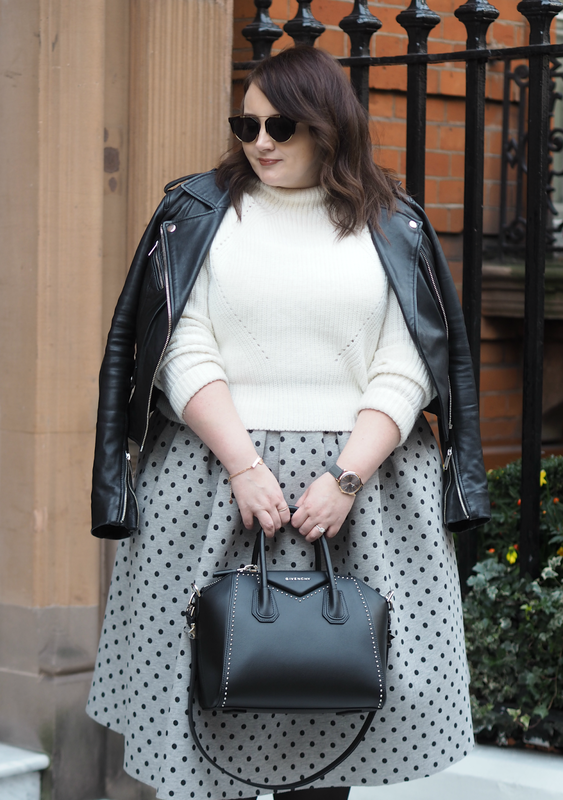 The jumper is a cheapo number from Primark, but the crop styles work so well with skirts (I hate having to tuck things in) that it’s worth trawling through their displays to find a gem, while the shoes are last year’s ASOS. 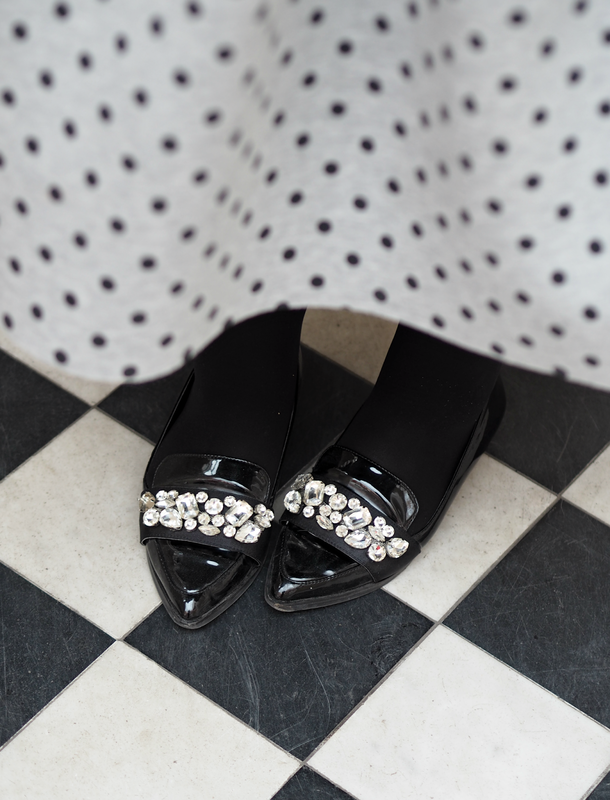 I bought these sparkly loafers after falling in love with them online, but when I first started to wear them they ripped my feet to shreds: I’d have to strategically plan where I was going and how much I was working if I wanted to wear them, as they were so blooming uncomfortable. However, when I rediscovered them at the bottom of my shoe basket this year they’d mysteriously become super comfy; I’ll never understand the magic that means uncomfortable shoes miraculously become worn in without you even realising. 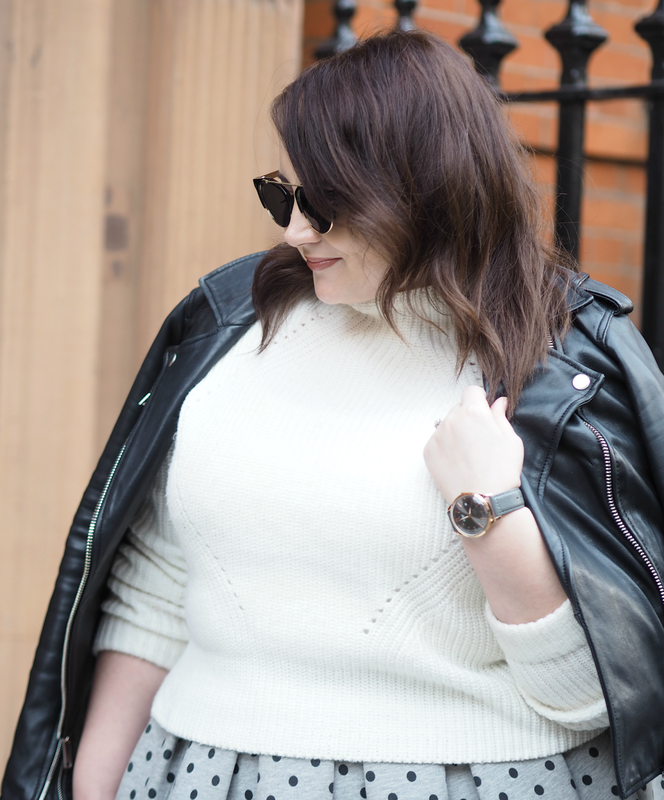 My fave addition to any outfit though is my trusty Oasis leather jacket, which goes with absolutely everything. I adore the material, it’s oh so comfy, plus it only gets better with age; it softens a super structured outfit, funks up a girlie look or makes your jeans-and-tee combo always seem more interesting. Personally I love putting it with a slightly more ‘office appropriate’ combo to relax the overall effect, while keeping me warm and covered up. 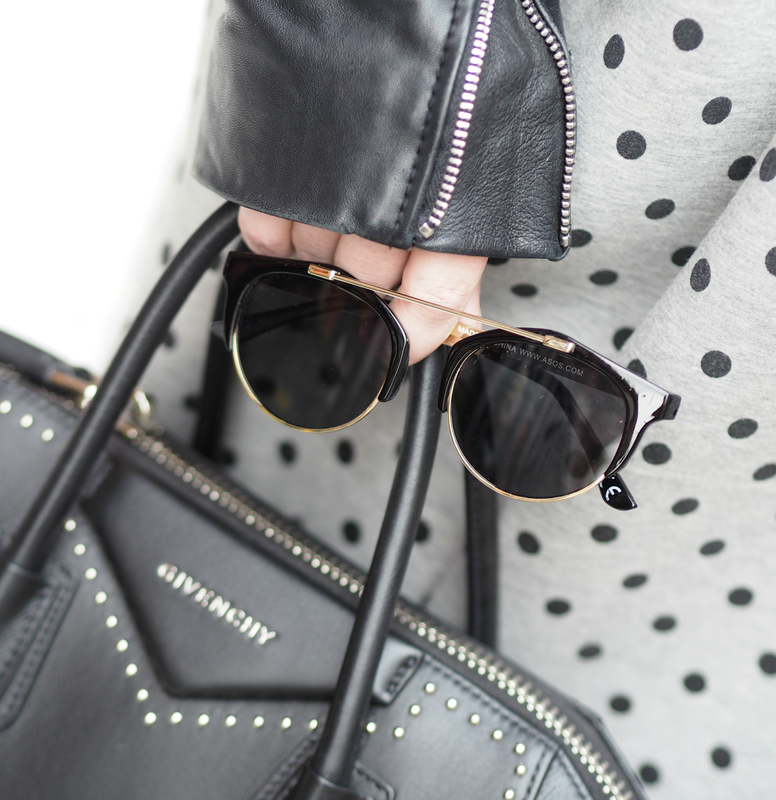 You just can’t go wrong with a leather jacket can you? 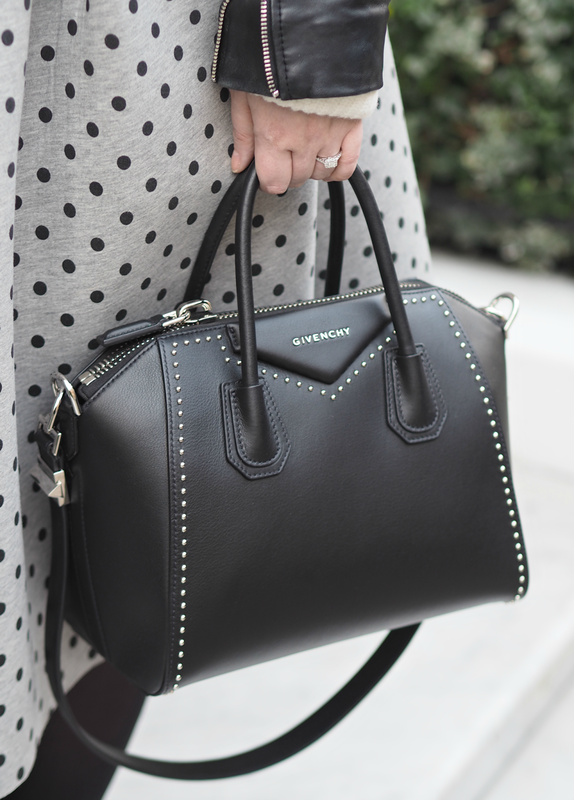 My current fave bag, the Givenchy Antigona, has been making numerous appearances since I picked it up in Bicester Village for a third off. It’s such a great size (it fits in all my stuff – including a camera, my book and a makeup bag) without feeling like I’m carrying around a suitcase; I’ve only had it a month or so but it’s the best investment I’ve made in a long time. Even better is that it matches my leather jacket perfectly! 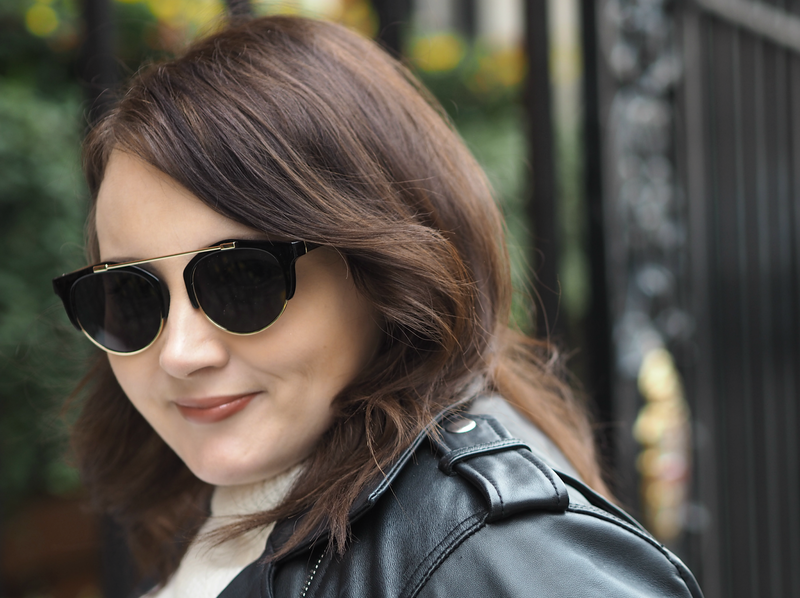 In addition to the bag, a great pair of sunnies helps to keep a look casual whilst phasing you into the new season; right now there’s a lot of sun even when it’s still chilly, so a simple pair of black sunglasses is an essential in my Givenchy. This pair are an ASOS bargain at only £14.00, but look a lot more expensive thanks to the high-fashion brow bar. On my wrists are also my current favourite things: two rose gold engraved bracelets bought for me by my fiancé. 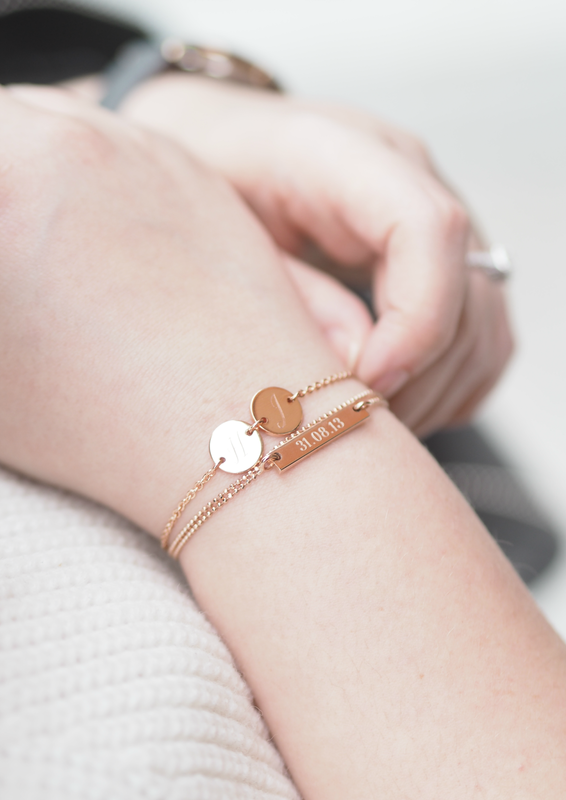 The first rectangular bracelet is engraved with the date we met and is from Beaverbrooks, the double bracelet detail making it a little different and making a subtle statement. I didn’t know that Beaverbrooks engraved, but they have a whole range of jewellery that can be personalised for free – so if you fancy it it’s well worth a look. The second bracelet is engraved with our initials and was bought from Not On The High Street as my Valentines gift, which matches perfectly with the one I got for my birthday a few months prior. 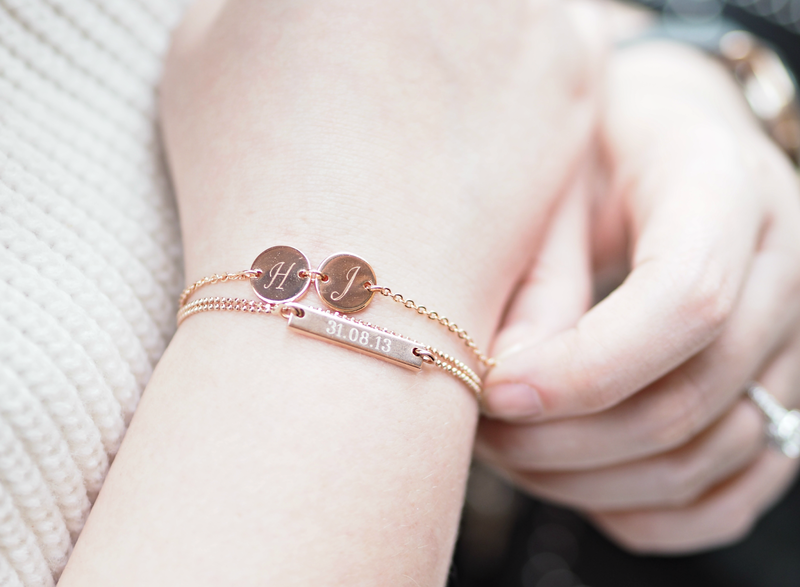 I’ve never been super fussed about expensive jewellery, but I do adore pieces that are personalised and mean something – both of these are just the ticket! Finally, another beautiful number from Henry London who is fast becoming my favourite watch brand. 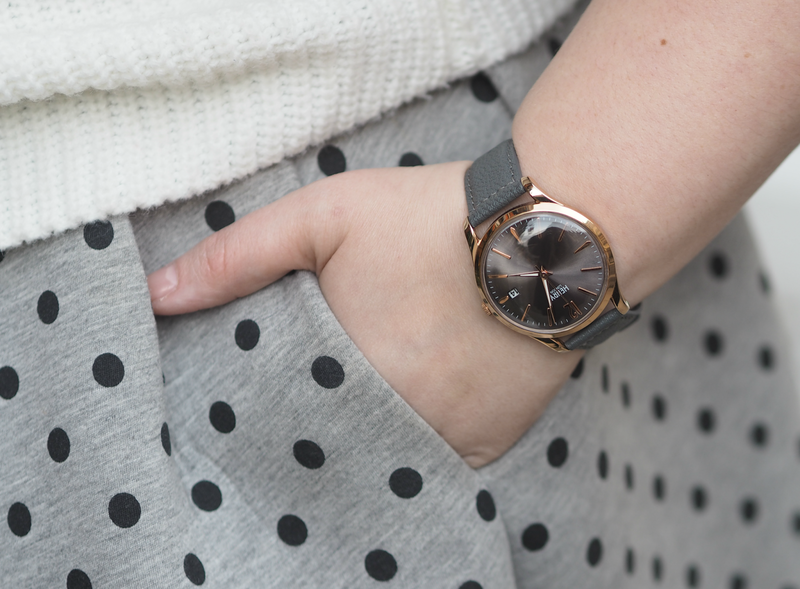 This dark grey strap is great for this time of year, when you want something dark without opting for black, while the rose gold detailing is refreshingly a perfect match for all my current most loved jewellery. 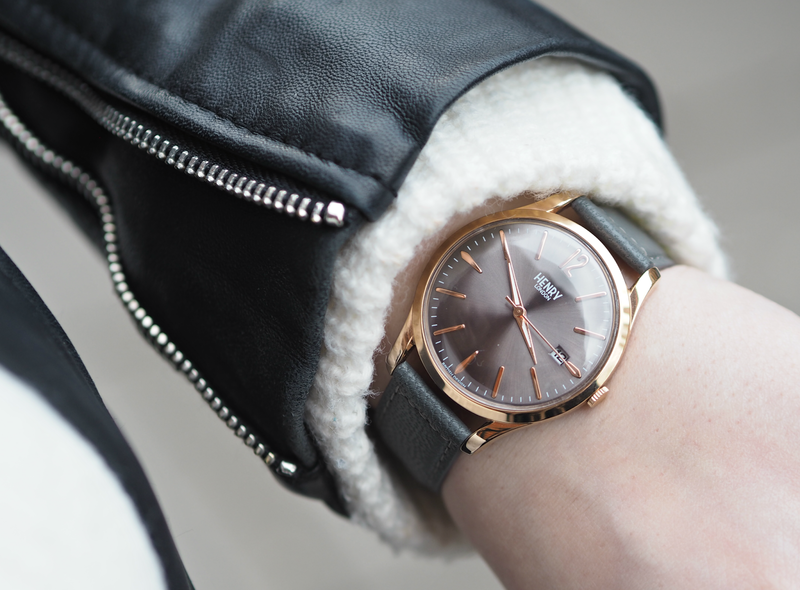 They have a huge selection of styles and colours, all beautifully crafted to provide something you’ll cherish for years to come (or change up every season if you’re a bit of a watch fiend!) Make sure you check them out online. I hope you like my look! What’s your fave piece from what I’m wearing? 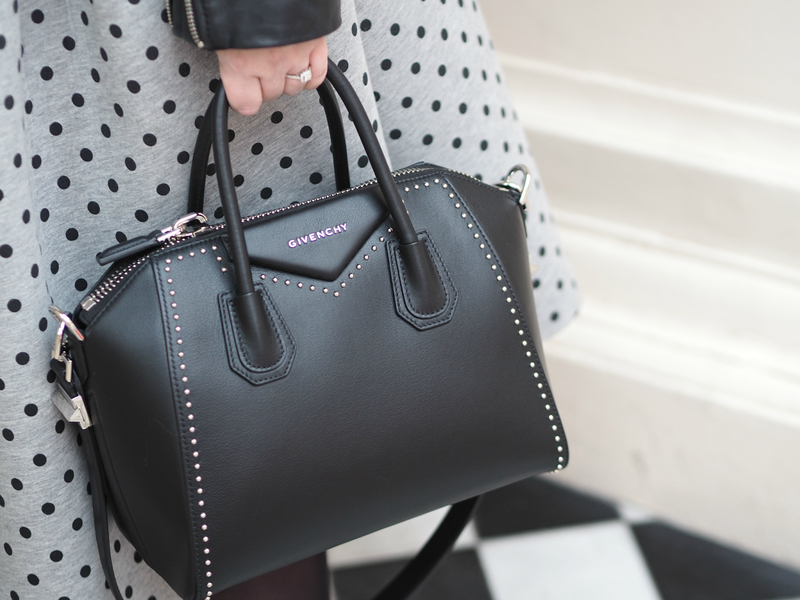 You can't go wrong with a polka dot!